This entry was posted in News, Tailoring and tagged spring, wedding season on March 29, 2018 by michael. Friday Style Debate – Should you wear your jacket when driving? We’re back after a long hiatus – time to debate! 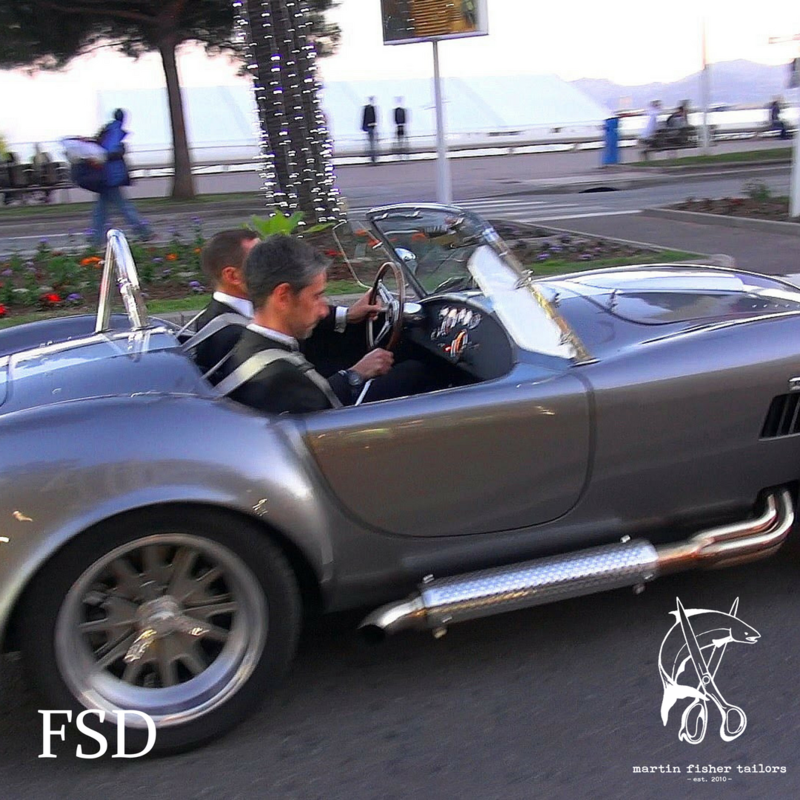 Yesterday I saw two guys in a beautiful convertible sports car – both were in jackets and it got me thinking as to the appropriateness of wearing a jacket when driving. Both guys looked great – overall they had a similar vibe to the two guys above (apologies for the grainy shot but it’s just too good an image to pass up). I’ll get the ball rolling on this one – my answer is no despite how good it can look. The bottom line is that it’s bad for the jacket as it inevitably leads to creasing in the back skirt of the jacket – something that never looks good when you emerge from the car as it undoes the stunning effect that it had when you were in the car! Secondly you have to wear a seat belt which is simply uncomfortable with a jacket that is naturally pushing upwards as the wearer is bent at the waist giving the skirt of the coat nowhere to go. The double over-the-shoulder straps seen above fixes that problem to a degree but I don’t suppose many of you out there have that option. 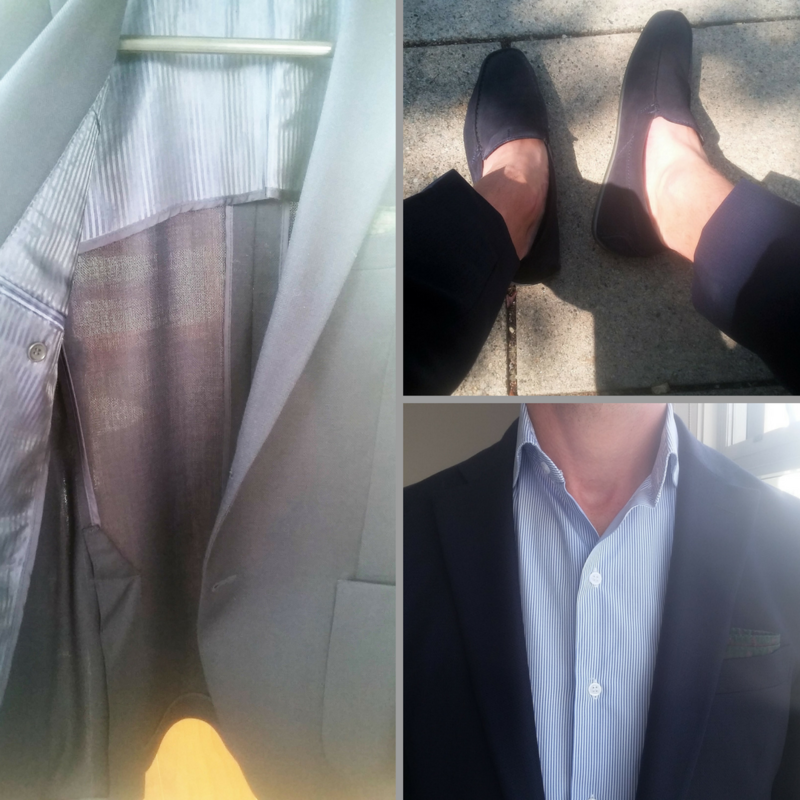 This entry was posted in Culture, Fashion, Tailoring, Uncategorized and tagged Friday Style Debte, Suits + cars on September 1, 2017 by michael. Forgo the tie – in certain business scenarios this will be difficult but if it’s appropriate do away with the tie. All the heat that is generated from your upper body needs a place to escape and opening up the top two buttons allows exactly that. Roll your sleeves – for those moments when you’re able to take your jacket off get those sleeves up. In combination with opening the top up you actually get full circulation which is critical to regulating that lower back and armpits. Let the ankles breath – in the same way that opening up your neck and wrists cools your upper body the same occurs with your legs when you go with the no-show sock instead of a traditional long sock. Baring your ankle might be a big step for some of you style-wise but once you feel the breezy cooling effect on your ankle you won’t go back when the heat turns up. 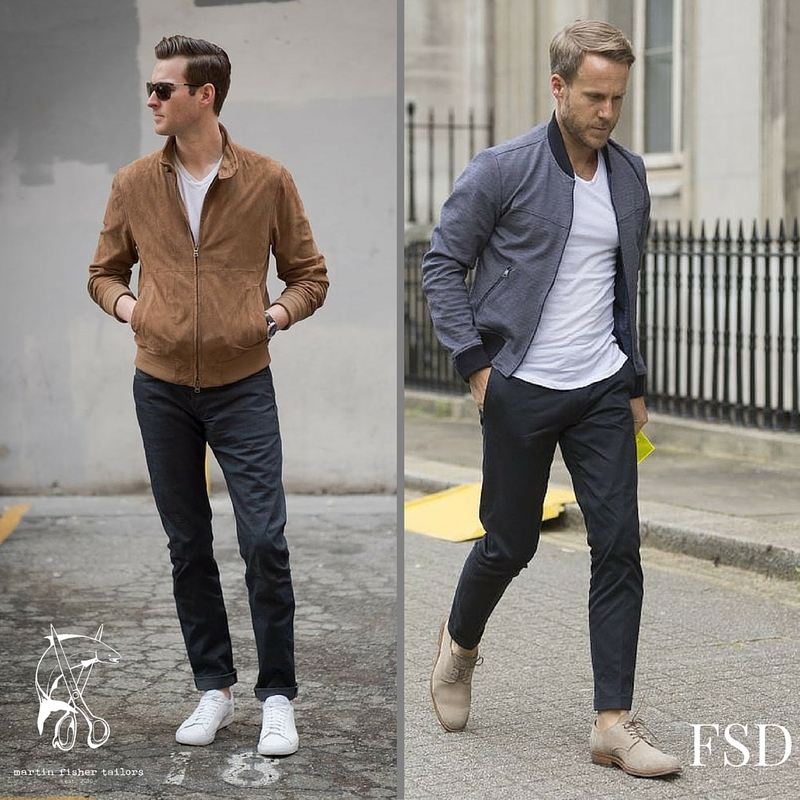 Unlined Jackets – the reality is that linings don’t breath as well as the cloth that your jacket is made from hence get rid of as much of it as you can in the warmer months. A warm weather cloth is made with a looser weave to enable your heat can escape and the cooler air around you can get in and cool you down. With that in mind shed the lining and allow the cloth to do its thing. Slightly fuller trousers – based on the first four tips it’s clear that air flow is critical to keeping yourself comfortable in the summer. A really trim pant makes this very difficult thus opting for a slightly fuller leg is a good play. Nothing drastic but an extra 1/2″ to 3/4″ in the circumference will make a noticeable difference. 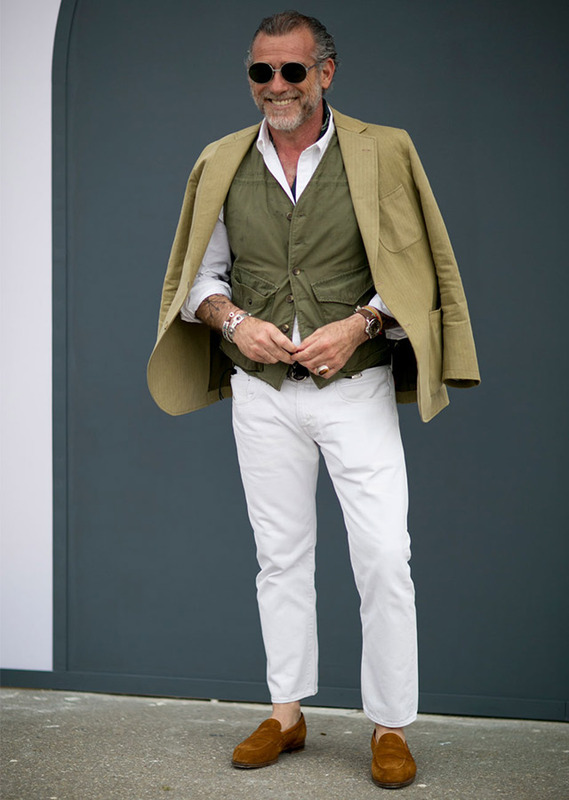 I’m in a bit of a rush this morning but a quick google search found me this guy – a pretty solid example despite the fact he is on the more casual side spectrum and that he has a vest on (he’s Italian thus he must deal with the heat better than us Canadians!). He does check all the boxes though – open neck, rolled sleeves, no-show socks, unlined jacket + the slightly fuller trouser. 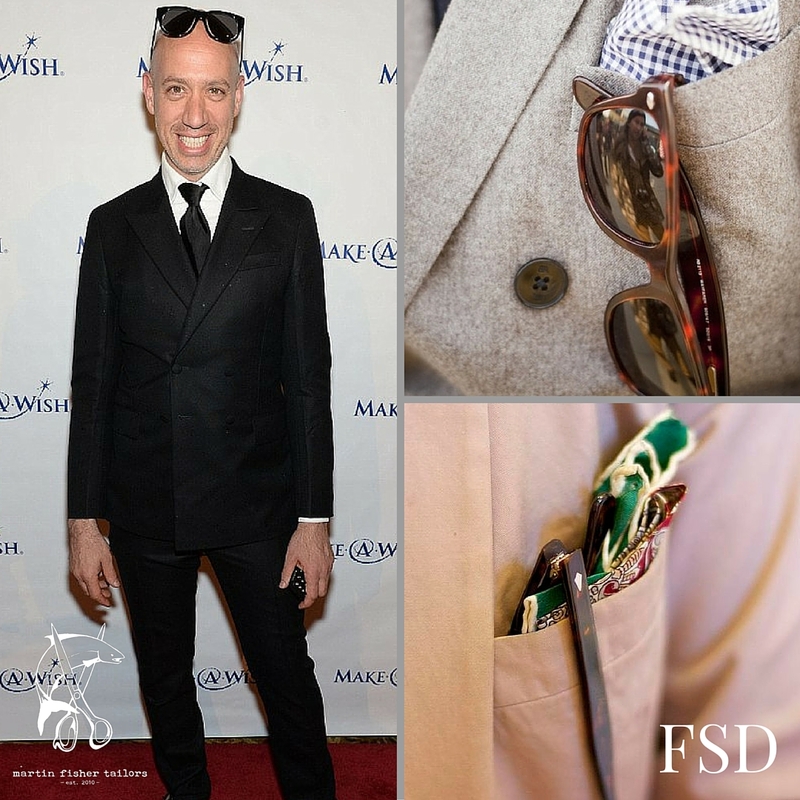 This entry was posted in Fashion, Tailoring, Uncategorized and tagged summer tips on August 1, 2017 by michael. 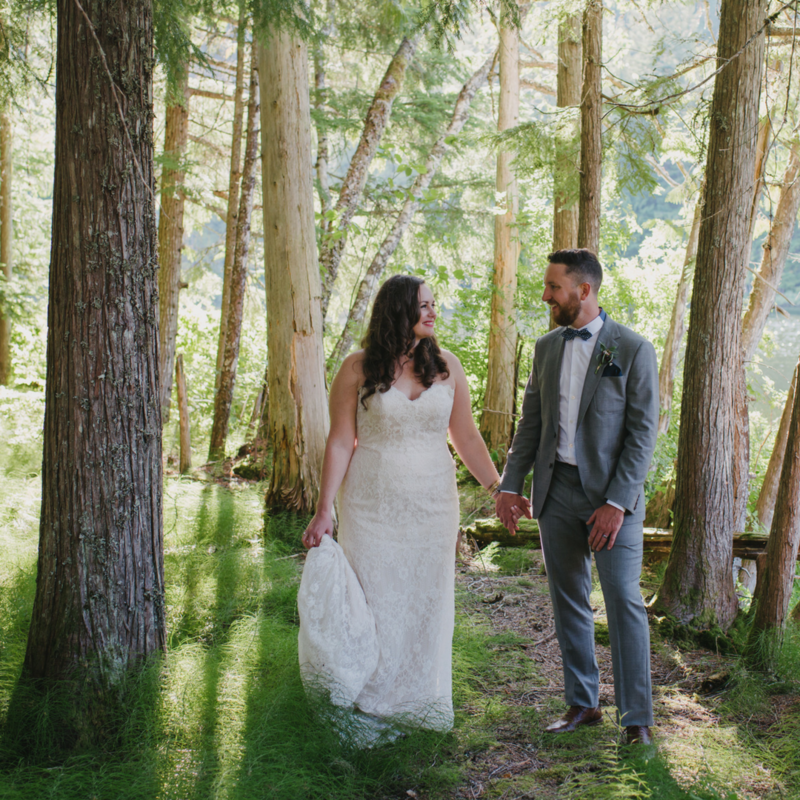 A stunning shot by Darby Magill of the beautiful Shea and Greg’s wedding from last summer. It was an obvious honor to craft Greg’s suit but in a neat little twist he brought into the shop cloth that his Grandfather had given him years back for this exact purpose. Cooler yet his Grandfather had worked in the mill that had made this hearty sharkskin cloth in Huddersfield, England. With that in mind the aim with the design was to be wedding friendly but also to craft a jacket that Greg will be able to wear in a multitude of different ways over the years. In the end the choice was to make it as lightweight as possible to allow the natural drape of the cloth express itself and in a little ode to English country charm we elected to go with the patch pockets. To nice effect I’d say. This entry was posted in Fashion, Tailoring and tagged Summer weddings, Weddings on March 1, 2017 by michael. It’s just past 5pm and not only is it still light outside but the sun is beautifully shinning down upon us. This means there is light at the end of this winter tunnel though I’ll have to conveniently look past the fact that they’re calling for more snow over the weekend to really enjoy the moment! Most importantly though the soft light makes me think of summer and with that naturally I start to think about wedding season. If you’re getting married this spring or summer it’s time to get planning – take the stress off and get in to talk things over with plenty of time to spare. It’s always safe to give yourself at least 4-6 weeks to make sure we can slow down and really enjoy the process of putting together your look. 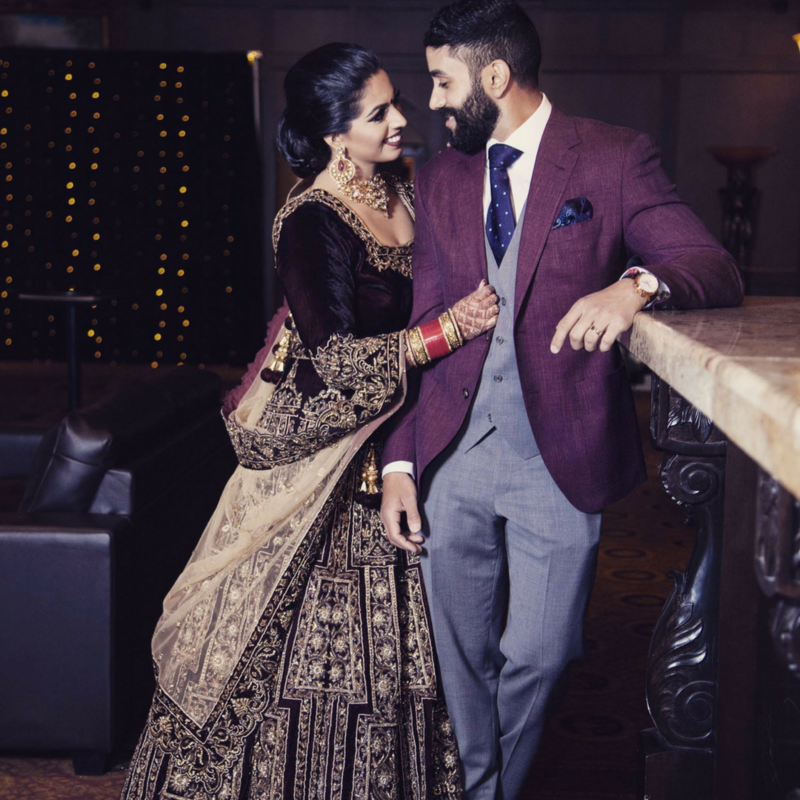 The inspiration from above comes from Gurminder’s wedding last summer. He wanted an elegant look first and foremost but one with a little pop for interests sake. I think we achieved that with the soft purple jacket made of a wool linen blend cloth from Loro Piana – finishing it off with a simple light weight trouser and vest combination made with cloth from Vitale Barberis Canonico. This entry was posted in Fashion, Tailoring, Uncategorized and tagged Summer weddings, Weddings on February 24, 2017 by michael. Now this fella has the je ne sais quoi to pull this look off – the proportions work and while it may not be everyone’s style cup of tea he looks pretty darn good. He’s also not in Vancouver – that said he is in Paris and it’s pretty cold there as well. For sake of our discussion though I happened to see a very similarly dressed guy today who was taking a smoke break tucked under the cover a building while it was -2 and snowing. 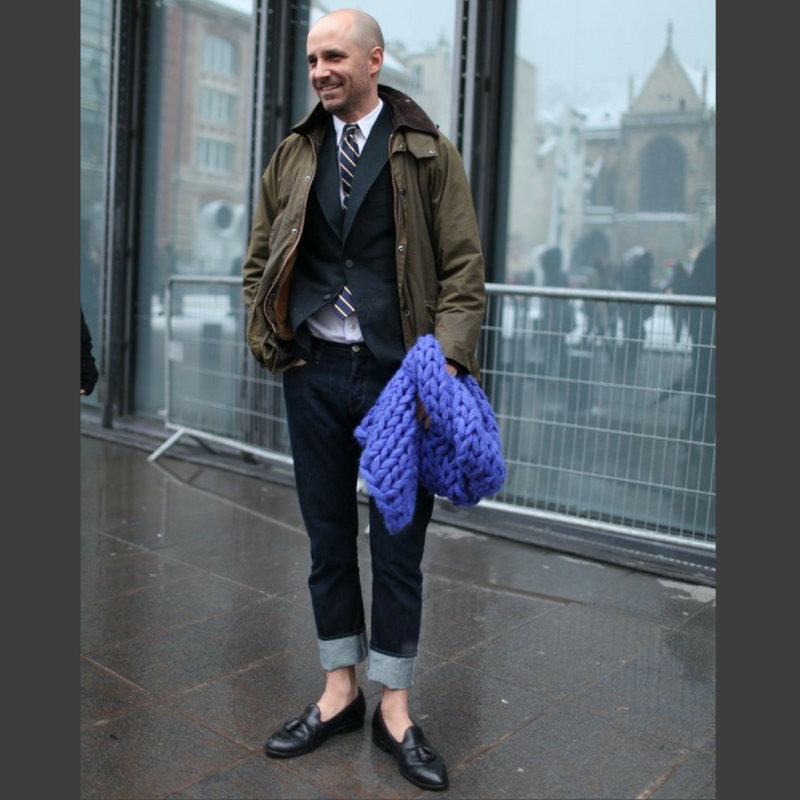 Which brings up the question of appropriateness – I dig and support the sockless look but it seems a touch try hard you’re bundled up in a toque and scarf on the top half. Certain sacrifices for fashion are understandable but this one in the winter seems like a step too far. This entry was posted in Fashion, Tailoring and tagged opinion, sockless style on February 8, 2017 by michael. Friday Style Debate – When wearing a suit where do you put your sunglasses (when you’re not wearing them)? It’s been quite awhile but the Friday Style Debate returns with an important public service announcement as this is less of a debate and more of a proclamation. I don’t think there is much wiggle room in this one but you guys might have a different opinion thus I expect to hear from you if that is the case. Simply put – if you’re in a suit your sunglasses should never be put on the top of your head. I think this is more than adequately shown with the image on the left. Unfortunately though many guys in this city seem to be unaware as I have seen it three times already this week. As for what to do when you’re not wearing them? My choice is always to slip them in the breast pocket (low left image) with one arm dangling out so as to keep it in place. Another option – though a bit too peacock’ish for my taste – is to have glasses on the outside of the pocket with a single arm resting on the inside. This entry was posted in Uncategorized on May 27, 2016 by michael. Friday Style Debate: What spring jacket are you wearing this year? We’ve entered that time of year where within a single day – or hour for that matter – we experience multiple types of weather. With longer days and warmer weather we also tend to become more active and thus dress for the entire day as opposed to different parts of the day. With that in mind it’s time to talk about the staple that is the spring jacket. For me the spring jacket is all about versatility. It functions as a bridge; between the warmth of the day and the cool of the evening or to transition us from a more casual environment to a setting that is more formal. 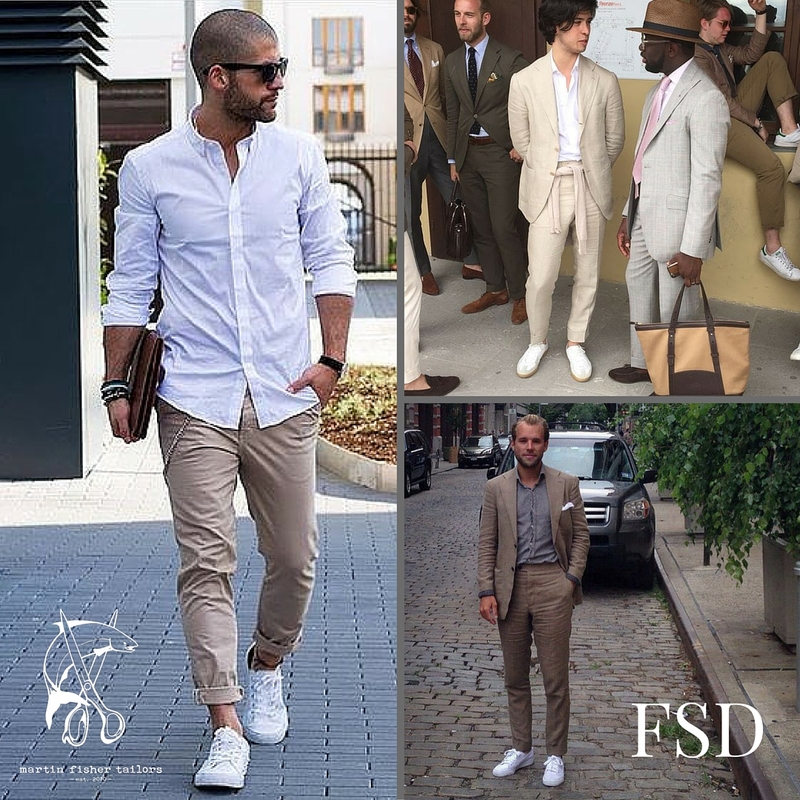 They need to be perfectly fitted – capable of being paired with sharp tailoring , a more dressed casual look (as seen above) all the way working with shorts. They can be in cotton, wool, suede, leather or even performance fabrics a la the athleisure trend. This entry was posted in Culture, Fashion, Tailoring and tagged Friday Style Debate on April 15, 2016 by michael. 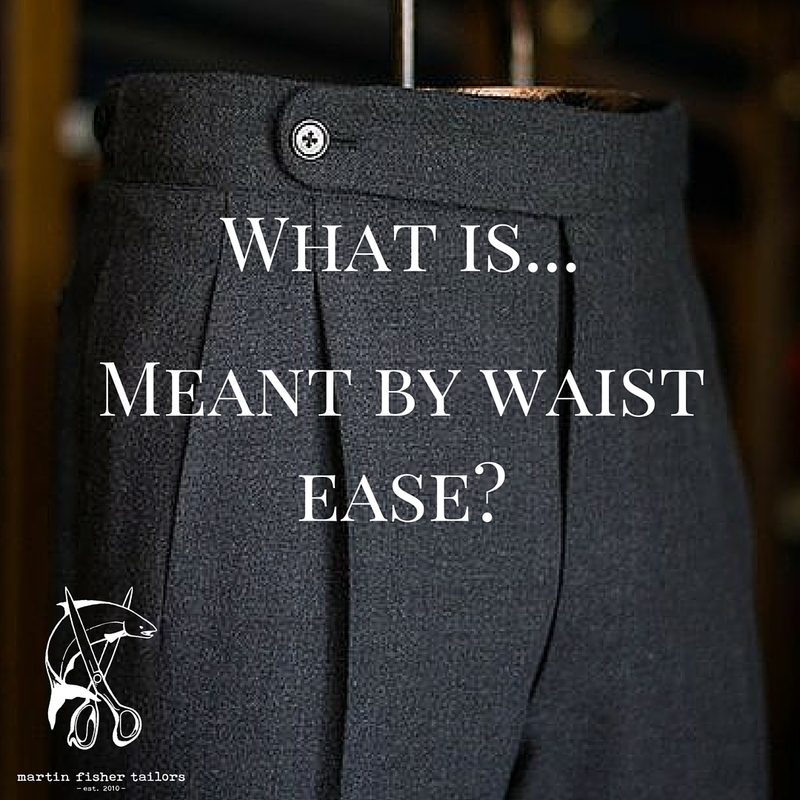 This weekly What is Wednesday post is aimed at answering some of the more basic and critical aspects of tailoring and the terminology we use to describe them. It stems from realizing that I’m constantly throwing out different terms with my clients and quite often they’re unsure as to what I exactly mean. 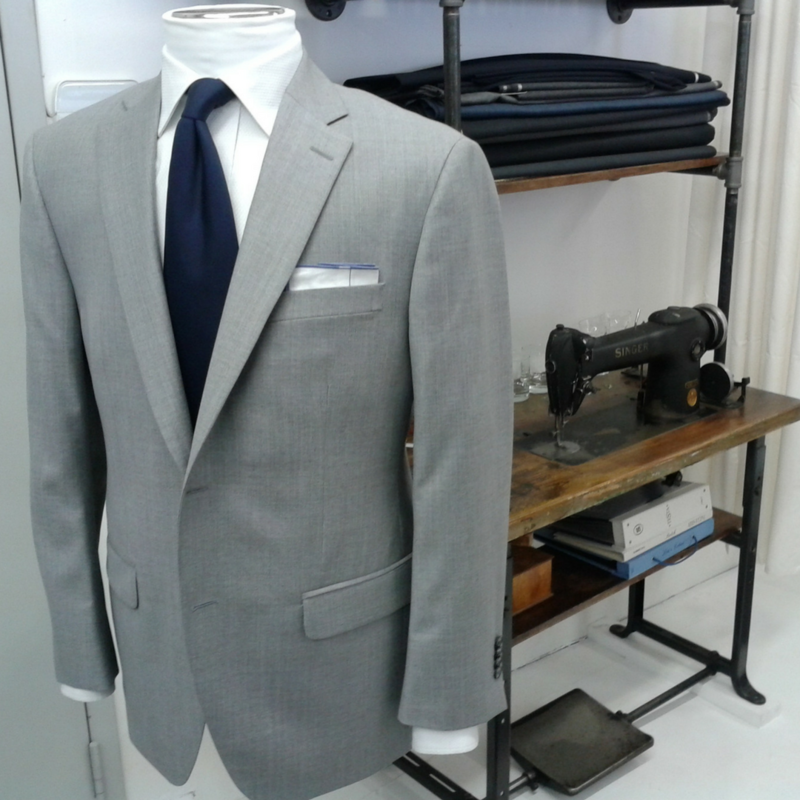 The goal of this section then is to alleviate this terminology gap and provide you with some know-how to talk tailoring with a little more ease. What is…meant by waist ease? We’re picking up from where we left off last week in regards to discussing a true waist. When we make a pant from scratch we always add a touch of ease at the waistband as opposed to making it the exact same width as the tape measurement. For example; if the waist measurement is 34″ then it is typical to add anywhere from a 1/4 to 1″ of ease. This is done to make the pant more comfortable for the wearer as well as to account for the slight fluctuation that occurs in the waistline throughout the day due to eating and drinking. How much ease should you add? That is a very personal question thus it comes down to what feels right for each individual. Put it this way – a pant should never “need” a belt rather the choice to wear one is to “finish off” a look off as opposed to be there to hold the pants up. To give a touch more guidance; on a personal level I prefer a relatively snug fitting waistband hence I go with a 1/2″ of ease. I find this amount accounts nicely for my standard weight fluctuations and is comfortable in terms of where it sits on my waist. That said I have clients who want it “on the verge” of tight and choose a 1/4″; while others prefer to use a belt and go with 3/4 to 1″ of ease. As always I’d love to hear your opinions on this or any sartorial subject for that matter. Better yet book a free appointment and we can banter in person and see if we might be a good fit to work together. This entry was posted in Fashion, Tailoring and tagged "What is Wednesday", what is...series on April 13, 2016 by michael. Friday Style Debate: Can you over do it with white? We’ve had an amazing week of weather and with sun returning so has the white sneaker. It’s everywhere – and with good reason as it is arguably the ultimate summer shoe. Which brings up the question though – is possible to over do it with amount of white within an outfit? I ask because a guy walked by me yesterday wearing something very similar to the fellow on the left in the image above. My first reaction – too much white. It was a little too jarring for me. The image at the top right though is essentially the same look but in this case he’s added a jacket. For me this changes everything as it creates a softer and more subtle overall look. As for the bottom right – I think the same thing can be said except that I would add that this would hold true even if he was to remove the jacket. That’s my take – now it’s you turn. This entry was posted in Culture, Fashion, Tailoring and tagged Friday Style Debate on April 8, 2016 by michael.